Calvin Watkins of the Dallas Morning News reports that, despite the perceived wisdom that Norv Turner would get the job, Chargers defensive coordinator Wade Phillips has been selected as the next head coach of the Dallas Cowboys. 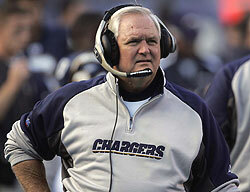 The Cowboys have selected Wade Phillips as their next head coach, according to a source. An official announcement could occur today. Jones who interviewed Phillips on Jan. 26, decided to go with a defensive-minded coach over Norv Turner, San Francisco’s offensive coordinator, who was considered a finalist for the position. The move is a surprise because of Turner’s close connections to the Cowboys. He was the Cowboys’ offensive coordinator from 1991-93 and helped form Troy Aikman’s Hall-of-Fame career. He was perceived as someone who could develop quarterback Tony Romo. In addition to Phillips and Turner, the Cowboys interviewed Jason Garrett, whom sources have said is expected to be named offensive coordinator, New Orleans defensive coordinator Gary Gibbs, San Francisco assistant head coach/defense Mike Singletary, Chicago defensive coordinator Ron Rivera, Indianapolis assistant head coach/quarterbacks coach Jim Caldwell, who met with the Cowboys on Wednesday, and three members of Parcells’ staff: Tony Sparano, Todd Bowles and Todd Haley. In choosing Phillips over Turner, Jones decided between coaches with extensive experience in the Cowboys’ two areas of focus: quarterback and defense. Turner is noted as an excellent offensive coach who also gets credit for the development of San Francisco quarterback Alex Smith. 49ers coach Mike Nolan said he doesn’t want to lose Turner because of how he has improved Smith’s game. Last week in Miami, Turner – and Garrett – celebrated with Jones when former Cowboys receiver Michael Irvin was selected to the Pro Football Hall of Fame. 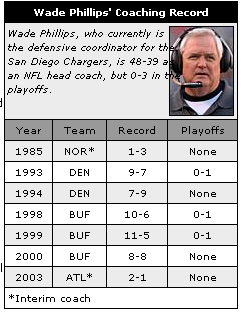 But Turner’s head coaching record is not a glossy one: he’s 59-83-1, including playoffs, with Washington and Oakland. Phillips was the first candidate interviewed not to have a tie to the Cowboys. This will be Phillips’ third full-time head coaching job and the first since leaving Buffalo in 2000. In three years with the Bills, Phillips had a 29-19 record and made the playoffs twice but did not win a playoff game. Buffalo has had just one winning record and has not made the playoffs since Phillips was fired following the 2000 season. He was 16-16 from 1993-94 with Denver, making the playoffs once. He held interim head coaching jobs with New Orleans (1985, 1-3) and Atlanta (2003, 2-1). The Cowboys were drawn initially to Phillips because of his work with the 3-4 defense. Over the last two seasons, the Cowboys drafted and signed players for the 3-4, like nose tackle Jason Ferguson and bigger linebackers, like DeMarcus Ware and Bobby Carpenter. But Phillips’ version of the 3-4 attacks more than the one the Cowboys have used. Linebacker Shawne Merriman led the NFL with 17 sacks in 2006 and has been named to the Pro Bowl the last two years. In 2005, San Diego had the top-ranked run defense, and in 2006 the Chargers led the NFL with 61 sacks. “I feel, defensively, he was one of the things we needed to come in,” said Cowboys outside linebacker DeMarcus Ware from Hawaii, the site of Saturday’s Pro Bowl. “We have so many guys that can do good things. And Wade just has an aura about him of what to do with those guys. I feel he can come in here and teach us something.” Ware also said he talked with Merriman about how Phillips gets a defense going. Ware said he was impressed with how Wade used his personnel, especially on blitzes. If this report is correct, it’s a strange and underwhelming choice. Phillips’ success in his previous four stops (counting interim appointments) has been merely mediocre. Further, this leaves an untested Jason Garrett in sole possession of the offense and development of Tony Romo. On the other hand, the Cowboys have invested most of their draft picks the last several years in the defense. Despite a wealth of talent, that unit collapsed toward the end of last season. If Phillips can get them to play up to their potential, the offense is already good enough to go deep into the playoffs. All Garrett would need to do then is teach Romo how to hold onto the ball. Or get someone else to handle snaps on field goals. UPDATE: Clarence Hill reports that “Phillips flew from San Diego to Dallas late Wednesday night and is working out contract details to become the seventh coach in Cowboys history.” That would seem to clinch it, unless Jones somehow managed to convince the Chargers to let Phillips come aboard as defensive coordinator. San Francisco 49ers offensive coordinator Norv Turner was widely regarded as the front-runner for the Cowboys job, but the hiring of former Dallas quarterback Jason Garrett might have doomed Turner’s candidacy. Garrett’s role has not been formally defined, but he will likely be named Dallas’ offensive coordinator. Turner is considered one of the premier play-callers in the league, and Jones might not have wanted to impede Garrett, who reportedly impressed the Cowboys owner in their interview. Considering that the continued development of Pro Bowl quarterback Tony Romo was a key factor in the coaching search, the choice of Phillips also means that the Jones is comfortable with former Cowboys backup quarterback and recent hire Jason Garrett running the offense. Garrett has been coaching only two years — as quarterbacks coach of the Dolphins. But he spent 12 years in the league as a backup, including seven behind Hall-of-Famer Troy Aikman in Dallas. Jones believes Garrett is one of the leagueâ€™s bright offensive minds and sees him as a potential head coach one day. Garrett was initially interviewed for the head coaching job, but two days later he joined the staff as offensive coordinator. Turner has a strong relationship with Garrett and would have been a willing tutor. But there is no question who would have been in charge of the offense in that scenario. With Phillips as coach, Garrett is in complete charge of the offense while being prepped to become the teamâ€™s next head coach. Phillipsâ€™ age and experience suggests that he wonâ€™t have a long tenure in Dallas. It may well be that Jones views Phillips as a transitional figure and is grooming Garrett to be the long-term coach. Certainly, at his age, he could be around for as long as Jones owns the team. Given the nature of the NFL coaching business, though, that would be an odd reason to hire a head coach. If Garrett elevates the offense to the first tier, he’d become a head coaching candidate elsewhere in short order. And, frankly, Jones doesn’t have a record of keeping coaches around very long, anyway. UPDATE: Nick Eatman, reporting for The Official Site, writes at 1021 CST that, “While more than a handful of candidates have remained in contention, it appears the search has come down to two front-runners, Wade Phillips and Norv Turner.” This hours after every other sportswriter in the country seems to think Phillips has been hired. That’s the vagaries of reporting for The Official Site, I guess: More access to inside information but unable to break news before the club is ready for an official announcement. Meanwhile, Hall of Fame NFL writer Rick Gosselin thinks Phillips an excellent hire, at least for the short term. [Owner-GM Jerry] Jones thinks the Cowboys are close to another Super Bowl. So do their fans. Dallas was one of 12 teams that qualified for the playoffs in 2006 and had it not been for a botched field-goal try, the Cowboys would have been among the final eight teams vying for a championship. Jones needed to find someone who gave the Cowboys their best chance for success in 2007 â€“ not two or three or four years down the road. The comfortable choice would have been Turner. With the departure of Bill Parcells, Jones wants to again assume the profile as general manager of the Cowboys. Jones knew Turner from the franchise’s Super Bowl era in the 1990s. They like and respect each other. Jones knew he could have a general manager relationship with Turner. Jones could re-establish a front-office hierarchy to his liking with Turner. Jones does not have the same relationship with Phillips, who has been a coach in the NFL for 30 years. They have never worked in the same building. But Jones knew that Phillips has been a head coach in the NFL for five-plus seasons and has carved out a 48-39 record. Jones also knew that in his first season as head coach both at Denver (1993) and Buffalo (1998), Phillips took his team to the playoffs. His history as a head coach is to win quickly. That made Phillips the safe hire. And, in Dallas, it’s always been about winning now. Former Dallas star Charlie Waters agrees. Cowboys beat writer Tim McMahon thinks Phillips was the best choices from the available candidates but is concerned about whether Garrett can get it done as offensive coordinator. Randy Galloway offers mixed reviews. He thinks Phillips is the coach with the strongest NFL credentials of any hired by the Cowboys since Jones came on board save Bill Parcells. He’s concerned, though, about the Jones influence. Son-of-Bum is a defensive specialist, with an excellent 3-4 pedigree, and with some success as an NFL head coach. But as the new man here, he had no say in the hiring of his offensive coordinator, or probably in the hiring of his top two offensive coaches. Jones already had young Jason Garrett in place as the OC before Phillips was interviewed for the head coaching job. And Tony Sparano, a holdover from the Big Bill staff and the offensive play-caller last season, is expected to remain in that job. Unless Phillips does add his own hire to the offensive mix, “Coach Jerry” has reverted to his old ways. I admit it â€” it makes me miss Big Bill already, no matter the Parcells’ record here. The Cowboys’ emphasis continues to be defense, defense, defense, almost all defense. It has been this way for more than a decade, with draft picks, and except for Chan Gailey, coaching hires. The bottom line for this ongoing defensive philosophy is failure, failure, failure. With Tony Romo, the offense showed life last season, but Romo needs ample tutoring. Turner is one of the best in the business in that area. Garrett, no matter the potential, has exactly two years on his resume as an NFL quarterback coach. You have to score points in this league to win consistently. You have to have a good quarterback to win consistently. But the Cowboys are still stuck on defense. The Ghost of Big Bill lurks with this Phillips’ hire. Parcells, of course, was a part of the process in hiring his replacement. It was Bill who brought the 3-4 to the Cowboys two seasons ago. Success didn’t happen with this alignment. Actually, the move backfired. With Parcells gone, a return to the 4-3 was a possibility. Obviously, Parcells would disagree with switching back so, when he’s conducting his interviews at Valley Ranch with Turner and Phillips, which coach do you think Bill recommended to Jerry? And how much did Jerry listen to Big Bill? Also, Turner’s answer for his defensive coordinator was Ron Rivera of the Bears, a 4-3 guy. Rivera interviewed Tuesday at Valley Ranch, not for the head coaching job, as it was advertised, but for Turner’s defensive coordinator. There was speculation from inside the bunker Wednesday that Rivera had not sold Jerry on the 4-3 scheme. But who says Jerry could have been sold, no matter the Rivera presentation? Bottom line: Jerry wanted to stay with the 3-4. Phillips is an excellent 3-4 defensive coach. Once again, it was about what Jones thinks is best for the defense, not the offense. Very scary. I’m not sure I get it, to be honest. Phillips has not succeeded in winning a single playoff game in many years as a head coach. He’s a brilliant defensive coordinator, just as Turner is a brilliant offensive coach and quarterbacks guru. Since hiring Turner would have allowed bringing on a high powered guy on the defensive side, say a Mike Singletary or Rivera, I’d have preferred that. Still, if Phillips can get the defense on track, this should be a very, very good team.